QRP Special and Introducing CQ Plus! 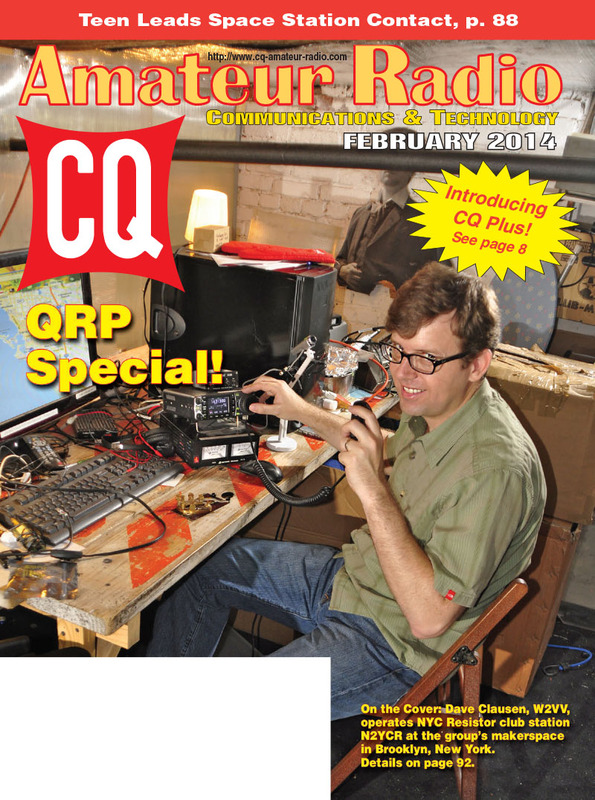 The February issue of CQ is this year's QRP Special, focusing on low-power operating. In addition, we are excited to introduce CQ Plus - a 50-page supplement to our digital edition, incorporating content from Popular Communications, CQ VHF and WorldRadio Online. Welcome to all Pop'Comm, CQ VHF and WRO readers! 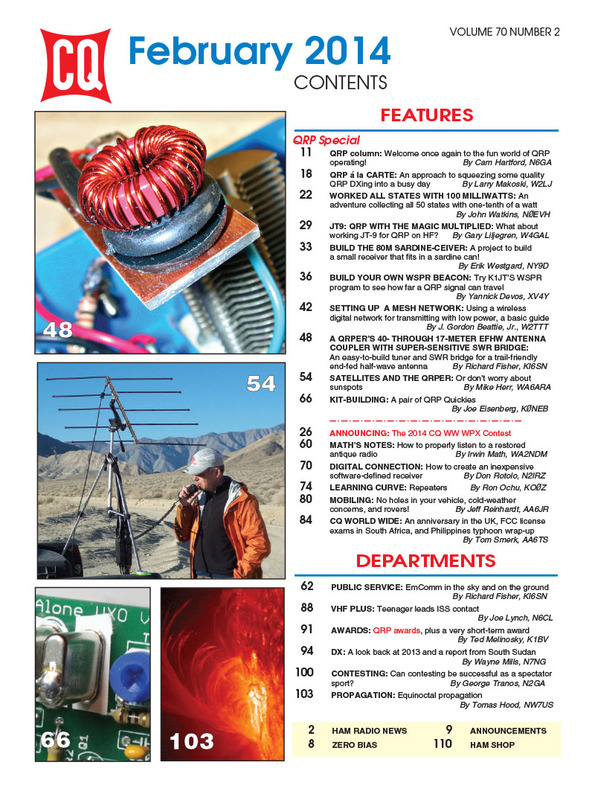 In the main section of CQ - which will be published in both the print and digital editions - our QRP Special focuses this year on the wide variety of modes and activities that fall under the low-power umbrella. We start off with QRP Editor Cam Hartford, N6GA's, column on the fun of operating QRP and of building QRP rigs and antennas. Next, Larry Makoski, W2LJ, takes us to lunch with "QRP à la Carte," explaining how he uses his lunch hour to get in some QRP operating time. And if you think making contacts with five watts or less is a challenge, check out John Watkins, N0EVH's, tale of working all states with just 100 milliwatts! Gary Liljegren, W4GAL, introduces us to the JT9 digital mode - designed for HF - which he describes as "QRP with the Magic Multiplied;" Erik Westgard, NY9D, walks us through building the 80-meter "Sardine-Ceiver," a companion to the late Doug DeMaw's classic "Sardine Sender" QRP transmitter; and Yannick Devos, XV4Y, shows you how to "Build Your Own WSPR Beacon." Still on the QRP theme, Gordon Beattie, W2TTT, follows up his October article on MESH networks in public service communications with a "how-to" on setting up your own Broadband Hamnet node; Contributing Editor Richard Fisher, KI6SN, has yet another project, "A QRPer's 40- through 17-Meter EFHW Antenna Coupler with Super-Sensitive SWR Bridge" (an EFHW, by the way, is an End Fed Half Wave antenna); and Mike Herr, WA6ARA, introduces us to working QRP on amateur satellites. 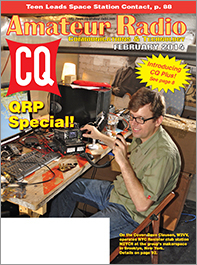 Finally for the QRP Special, Kit-Building Editor Joe Eisenberg, K0NEB, offers "A Pair of QRP Quickies." We've also got the rules for the 2014 CQ World Wide WPX Contest, with the SSB weekend on March 29-30 and the CW weekend on May 24-25. Among this month's columns (beyond the two mentioned above), "Math's Notes" editor Irwin Math, WA2NDM, explains "How to Properly Listen to a Restored Antique Radio;" Public Service Editor Richard Fisher, KI6SN, looks at "EmComm in the Sky and on the Ground," and Digital Editor Don Rotolo, N2IRZ, discusses "How to Create an Inexpensive Software-Defined Receiver." "Learning Curve" editor Ron Ochu, KO0Z, offers a tutorial on the inner workings of a repeater system; Mobiling Editor Jeff Reinhardt, AA6JR, covers "(No) Holes in Your Vehicle, Cold-Weather Concerns, and Rovers;" while International Editor Tom Smerk, AA6TS, takes us to the United Kingdom, South Africa and the Philippines. VHF-Plus Editor Joe Lynch, N6CL, settling into his new home and job at the U.S. Military Academy at West Point, reports on 16-year-old Rebecca Rubsamen, KJ6TWM, who coordinated a contact with the International Space Station at her former elementary school; Awards Editor Ted Melinosky, K1BV, covers several QRP awards (in keeping with our overall theme) and one very short-term award, and DX Editor Wayne Mills, N7NG, looks back at the topics he covered during 2013 (with updates) and reports on his participation in a DXpedition and amateur radio regulation workshop in South Sudan. Contesting Editor George Tranos, N2GA, wonders if contesting can be turned into a spectator sport as well as a participation sport, and Propagation Editor Tomas Hood, NW7US, reports on equinoctial propagation, or the conditions to expect around the spring equinox in mid-March (the conditions begin earlier). The print edition of CQ ends here, but the digital edition continues - with our inaugural issue of CQ Plus, a 50-page supplement incorporating content from Popular Communications, CQ VHF and WorldRadio Online. We start with "Washington Beat," our monthly look at FCC and Capitol Hill actions affecting communications, followed by a CQ Plus Report on the future of AM broadcasting called "The Power of the Microphone," by CQ Editor Rich Moseson, W2VU; and a companion report on the FCC's current effort to "fix" AM broadcasting by "Horizons" columnist Rob de Santos, K8RKD. Next, in honor of Valentine's Day, CW Editor Randall Noon, KC0CCR, offers "A Valentine's Story: Romancing the Key." "Listening Post" editor Gerry Dexter, WPC9GLD, reports on a big SWL shuffle for Miami Radio International and offers his monthly World Band Tuning Tips. (Note: Listener reports are now online on the CQ Plus Listening Post blog at <http://cqpluslisteningpost.blogspot.com>.) CQ Plus Editor Richard Fisher, KI6SN, offers a tutorial on starting out in VHF/UHF scanning … on the Internet! Pirate Radio Editor Steven Handler, WPC9JXK, has an interview with Commander Bunny, "The Radio Pirate Who Would Be President" (look for pirate station loggings at <http://cqpluspirates.blogspot.com>); and KI6SN returns with his "Trail-Friendly Radio" column on measuring your antenna's location possibilities without ever leaving your computer. 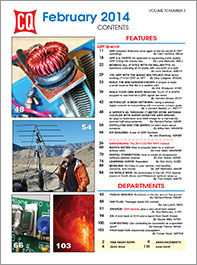 "Medium Waves" editor Bruce A. Conti, WPC1CAT, reports on a listening DXpedition to Prince Edward Island; "Personal Communications" editor Cory GB Sickles, WA3UVV, weighs in on "Freeband: Intervention in a ‘Love-Hate’ Relationship;" "Practical Propagation" editor Carl Luetzelschwab, K9LA, continues his discussion of "The Need for a Smoothed Solar Index" (Part 1 was in the January issue of WorldRadio Online), and Propagation Editor Tomas Hood, NW7US, offers his monthly guide to "Optimum SWL Working Frequencies" (Look for additional propagation info on the CQ Plus blog at <http://cqpluspropagation.blogspot.com/>). "Shannon's Broadcast Classics" makes the jump from Pop'Comm, as author Shannon Hunniwell, WPC2HUN, takes us for a trip "On an Electromagnetic Wing and a Snowy Winter Evening’s Prayer." We close with "Unwired," our monthly look at "the Weirder Side of Wireless and Beyond." That's a brief look at what's coming up in the February issue of CQ magazine. For information on becoming a CQ subscriber - print or digital - click here! Zero Bias - "CQ Plus - We're Changing to Better Serve You"